A critical investigation on why the vampire genre has evolved so dramatically. When the vampire genre first appeared in popular fiction with Bram Stoker’s novel ‘Dracula’, written in 1897, the character of Dracula was derived from Slavic folklore, focusing on the history and culture of Transylvania. Throughout the early 1900s vampire films became more and more popular even before the screen adaptation of Dracula in 1931. During this early period, vampires took on the iconic features that characterise Stoker’s vampire: lust for blood, the fatal reaction to sunlight and the intolerance of the cross and holy water. Institutions drew on these stereotypes until the sub-genre became associated with these defining features. 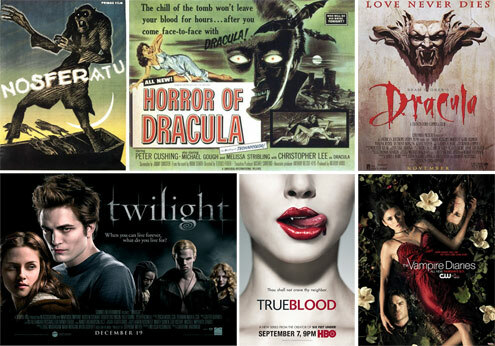 The vampire genre was also heavily associated with the horror genre, originally being derived as a sub-genre featuring the typical ‘horror’ features: designed to be unsettling, to cause dread and alarm whilst evoking the audience’s most hidden and worst fears (Filmsite, 2011). So, how has such a long established genre progressed from a caped man residing in a dingy castle in the hills of Transylvania and feasting off helpless young women like Christopher Lee’s Count Dracula (1958), to the vampires of today’s culture: the romanticised, highly sexualised flawed superhero figure trying to find their niche in society and become accepted for who they are, as shown in popular texts such as the Twilight saga (2008), True Blood (2008) and The Vampire Diaries (2009)?